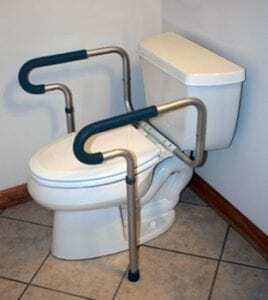 Toilet safety rails are an indispensable bathroom devices that helps individuals who suffer from injuries, have balance issues, mobility impairments, arthritis, or generally old age. With that said, you may require a toilet safety rail at a certain point in your life (Source). This particularly includes making our institutions and households accessible to all, right from the staircase to the bathroom. Sometimes you may even be injured or get to the age where you would require extra support. There is a large number of toilet safety rail models that surfaced on the market. Buying and deciding on a toilet safety rail can be difficult for individuals who know nothing about the topic. The guide reviews the five top rated toilet safety rails out there. We will discuss factors like size, strength, warranty, and more. 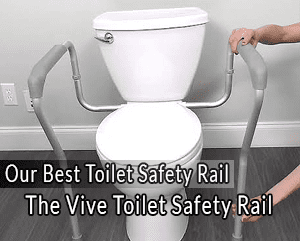 The Vive Toilet Safety Rail is a freestanding unit, ideally designed for users who may have a variety of handicap issues or elders who might find it difficult to use washrooms without assistance. They have a universal fit, which can be used with both regular and irregular shaped toilets. The rail is sturdily built, can support up to 300 pounds of weight with ease, and can be used by tall and huge people. Their armrests have extra padding the offers comfort and a better grip. The rail features a magazine rack, which can be put on any side of the Vive Safety Rail. The outstanding feature of this safety rail is how sturdily it has been built. Rubber grips on the armrests provide more security when standing up and sitting down. For this reason, the Vive Toilet Safety Rail has received plaudit of being the best stand-alone safety rails. The Carex Health Brands Bathroom Safety Rail measures 20 inches in length by 23.2 inches in depth and by 33 inches in height. Measuring 9 pounds, the rail is light in weight and is a well-built rail that stands on its own. That means it does not have to be attached to the toilet for use. However, it is easy to move it out of the way in cases when it is not in use. The rail can be used for the toilet when you have to sit and also supports you when standing at the bathroom sink to provide required additional support. Additionally, the rail is made with rubber handles that lets you have a tight grip. With this, the user is assured of secure support. The rail is easy to assemble without having to worry about to use tools. Most users who have purchased this rail have hailed as the easiest to install and use. Drive Medical Stand Alone Toilet Safety Rail weighing measures 21 inches width, 25.5 in height supports up to 300 pounds of weight. The rail is stand alone, which means users do not need to worry about attaching it to the toilet. The seat is sturdily built to support large weights. The rail is freestanding to fit both elongated and standard toilet seats. Additionally, it comes with a convenient magazine rack. The rail also comes with padded armrests to provide more comfort to the user. The padded armrests are not only comfortable but are easy to grip due to the soft padding. The rail is easy to install, and users of this seat are assured to assemble it with no worry of having to use tools. The sides are wobbly, and they do not line up. The seat measures 16.25’’ by 19.5 ‘’ by 11.5’’ inches and can support the weight of up to 300 pounds. 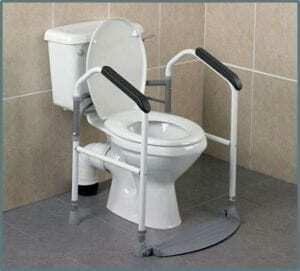 The Drive Medical safety Rail is well built for helping seniors and handicapped for toilet purposes. The rail is designed in a way that the can adjust to fit both standard and elongated toilets. Usually, the width adjusts from 16.5 to 19.5. If you have arthritis, injuries poor balance or any kind of limited mobility this is the seat for you. You will not regret. The rail is easy to assemble, and will not require extra tools to install. The seat boats of very soft and padded handles that offer more comfort as well as a secure grip to protect their users during their washroom activities. The seat has received many plaudits from users in terms of the price they go for on the market. Their ability beats the price. The rails are made from aluminium, which is not only long lasting but also lightweight. Their lightweight does not take away the fact that they are strong nevertheless. The rails have received plaudits for their stability, which assures the user of enough security. 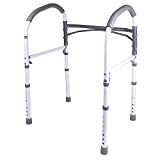 Toilet safety rails as said before in this guideline are essential equipment for the elderly, or otherwise incapacitated people who may require extra stability. The rails help them while lowering and raising themselves to and from the toilet respectively. For that reason, they require precise and strong installation to assure the user of enough security. Apart from that, a strong installation makes the seat easy to use as well. Take out the 2 nuts from the toilet seat bolts. You can then lift the toilet seat off. Bring into line the brackets with the holes that are on the toilet seat. You can then replace the seat and tighten the nuts securely. After that, put the safety rails into the brackets to lock them in appropriate place. Assemble the stand-alone toilet safety frames. 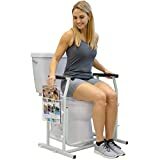 Then you can place the rail around the toilet seat with arms being at both sides..
You can then adjust leg extensions to reach an appropriate height. Because these rails are not attached, apply a force directly downward with caution. There are various things you will have to consider before going to the market to buy a safety rail. Most equipment are prone to unexpected dents and breakages and so do toilet safety rails. You may never know when such incidents will happen. Ensure that you are granted a comprehensive warranty package despite being convinced by the quality of your rail. Warranty serves to show that the rail is not only high quality but also the manufacturer is 100% positive about it. The advantage of a warranty is that it is easy to replace your safety rail in case of any faults. There are different sizes of safety toilet rail. However, choose a rail of the exact dimension that you will need. Small sizes may offer limited services because they will not fit on all toilet seats. That will mean that you will have to get a bigger sized rail, which can be expensive because you will have to refinance. In terms of strength, choose a rail that is stable enough. Sturdy rails will be able to support people who weigh the biggest of the weights. apart from that, any user will feel secure using the rail as they will feel it is strong enough. Sturdy can also mean durable, and a sturdy rail can be used for such a long period without worry. Toilet safety rails cannot handle all types of weight. Averagely they support the weight of up to 300 pounds. Some seats support 250 pounds though. Always choose a seat that can be able to hold up the user without causing any more injuries. Adjustability refers to the ability of a rail to be stretched to fit the required height. Different users will require different sizes of rails in terms of height. It is good to note that an adjustable rail will fit a number of toilet sizes, ranging from standard to elongated. The design of the rail matters big time. Some rails come with slip-resistant features. Such kind of rails will assure the user of maximum security. Some rails come with special features like magazine racks, which is an added advantage. There is a difference in padding material in all rails. Some rails have been made with the best-padded material at the armrests for comfort. Different kinds of safety rails are available at the market at different price tags. The price range is brought about by the differences in quality, design and other incorporated features. A rail with more features like the magazine rack will always be pricier than that without. Quality always comes at a price. This is to say that, you are going to spend if you want to buy a high-quality toilet safety rail. 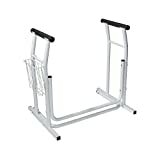 A quality toilet safety rail is highly adjustable has a good design and comes along with unique features that make it easy to use. That said, always aim for an affordable rail that serves your purpose. So there you are, a breakdown of the five best toilet safety rails you can find. The problem with safety rails is that there are so many on the market that you may not know where to begin. For optimal use, find a rail that is made of designed with special features that provide more security. The best toilet safety rails have the best design, is easy to assemble, can support a variety of large weights, are highly adjustable to fit various toilet sizes and above all, affordable. If selecting one is too much for you, you can choose your best two of the five options above. With that, you will be assured of assistance as you recover from your surgery, deal with mobility impairments or as you age gracefully. Please let us know which of the five testers you opted for. Share any good or bad experiences you might have had as well.